It felt like a Championship. Nine teams. Bellowing athletes crowded the last corner and the straightaway during the 4 x 4 instead of slinking off to the bus. When the last runner had crossed in the 4 x 4 attention shifted to the pole vault where three athletes from Brunswick and Skowhegan were still alive. When Brunswick's Caleb Rand and Ryan Olson went out at 11-6, Skowhegan's Clayton Miller had the event won. Asked where he wanted the bar next, he responded "13-01, I'm going for it." Miller paused to seek out family for a word of encouragement. And then, he had it. A new school record. A new PR. And now the second highest vault of this outdoor season. But when the points were totaled the Brunswick Dragons had prevailed in the boys meet accumulating 194 points to 168 for the runner-up Cony Rams who were followed by Lisbon (112), Skowhegan (63), Morse (59), Boothbay (56) , Hall-Dale (54), and Dirigo (11). For the girls Cony collected 215.50, runners-up Lisbon had 123.50. Brunswick (109) Skowhegan (80.50), Morse (68.50) Boothbay (51), Hall-Dale (39), Oak Hill (12), and Dirigo followed. With Brunswick getting four of the top five scorers in the 100, led by Hunter Parker's 11.76, it was no surprise that they also took the 4 x 1. The Dragons also claimed the top two spots in the 200 as Mitch Lienert came across in 23.92. 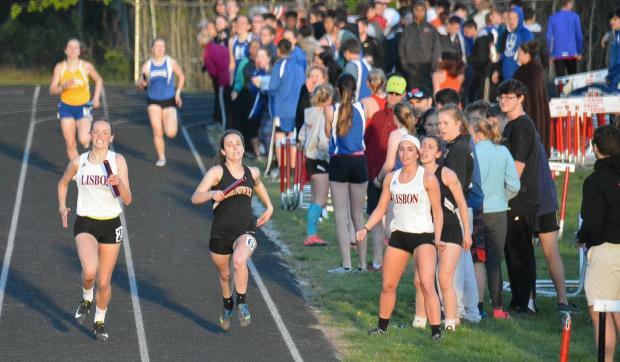 But it wasn't just sprints for Brunswick as they also claimed the top spots in the 1600 and 3200. Cam Ashby took the 3200 in 10:55.46, teammate Aiden Simmons followed him across for the secomd position and Andrew Chingos took fourth. Brunswick took four of the eight scoring spots in the 1600 as Will Shaughnessy cracked 4:40, coming in at 4:39.61, just 0.61 shy of the state auto-qualifier. 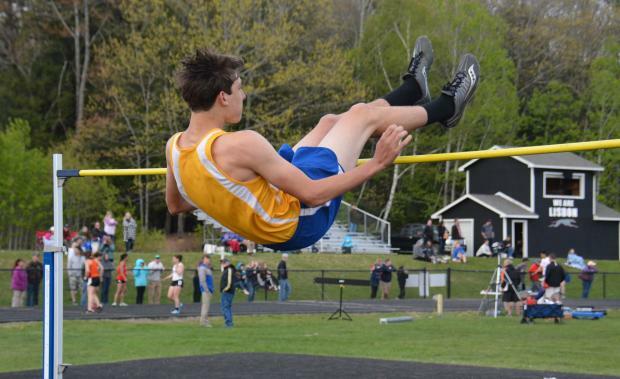 The vertical jumps were good to Brunswick too as Caleb Rand, Ryan Olson, and Michael McCrum went 2-3-4 in the pole vault, behind Skowhegan's Clayton Miller. Olson also figured in high jump taking second behind Brunswick's Sam Cenescar. Cenescar won the event on jumps at 6-0. The high jump had a championship atmosphere to it. Six of the competitors are in the six-foot club. Three of them-Censcar, Cony's Elijah Dutil, and Boothbay's Jay Hasch have cleared 6-2 this outdoor season. 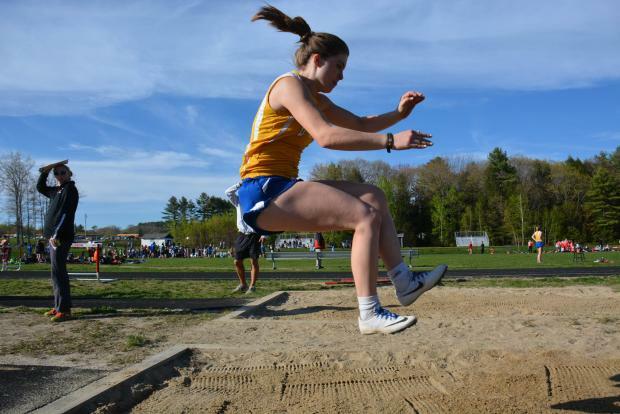 Hasch came closest to clearing the bar at 6-2 but based on earlier jumps had to content himself with third on the day; he also collected second at the triple jump to lead Boothbay's scoring. Ashtyn Abbott, who has gone 6-0 this season, took fourth at 5-10 and collected a pair of third place finishes in the triple and long jump to lead the Hall-Dale effort. The Cony Ram's second place finish was predicated on a very strong showing through the middle. The Rams took top spots in the 4 x 4, 4 x 8, 400, 800, and 300 meter hurdles. Travis Nickerson blurred to a win in the 800 at 2:01.86 and also ran legs in the 4 x 4, and 4 x 8. James Olivier took the 400 (52.31), and the 300 MH (43.69). The Rams have a solid hurdle team and took the top three spots in the 300 MH. Nathan Berry who was second at 300, also finished second in the 110 MH and the discus. 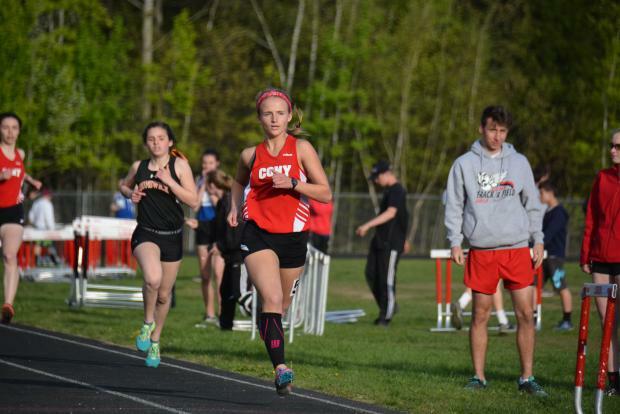 Cony's women's hurdlers are just as dominant. Following Olivier for third place in the 400 was Cony's Ali Albraini, who also nabbed a third in the 200. Perhaps more notable was Albraini's third leg of the 4 x 400 to close the meet. Cony had started in solid position with a comfortable lead after the first leg only to have Brunswick's Hunter Parker burn through the second leg and leave the Dragons in the lead, but Albraini brought the Rams back making his pass at the last bend and using the home straight to give the Rams a lead that would not be threatened in the anchor leg. 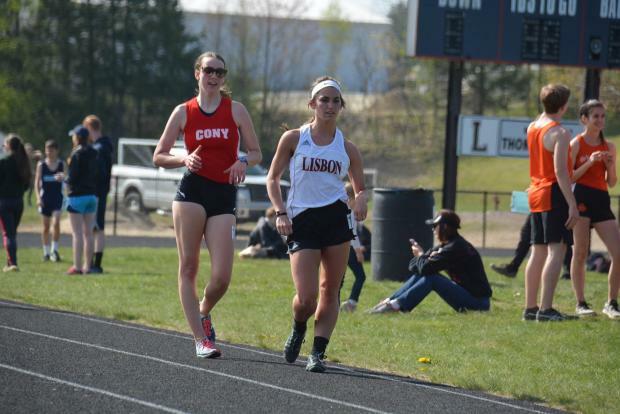 As Cony crowds the hurdle field, Lisbon dominates the race-walk. The Greyhounds took top spots in both men's and women's meets, but the men's team has a pair of athletes, Alan Lavoie, and Geoffrey Shambarger, each of whom go below the 8 minute auto-qualifier for class A. Each would have huge cushion in Class B or C. Lavoie finished in 7:25.46, while Shambarger strode across at 7:55.81. The Greyhounds also got good points in the 100 meter hurdles where they went three-four-five-six, and the 1600 where David Schlotterbeck took second after running just off of Brunswick's Will Shaughnessy's shoulder until the final 200 meters. Ben Blake was second in the long jump. Adding to the drama surrounding Clayton Miller's pole vault win, the bright orange jerseys of Skowhegan took four other wins. Miller also took first in the javelin (140-10) and Kyle Jacques had a pair of wins in the sand taking the long jump at 19-04 and the triple with a bound of 40-07. Andrew Ireland staved off complete Cony hurdles dominace by claiming first in the 110 MH; he also placed in the 100. William Carrolton led the Morse Shipbuilders in scoring by taking the discus (127-02) and the shot put with a throw of 42-07.5, both new personal marks. Ben Brewer was second in the 400 and place in the pole vault. Austin Baltazar collected third in the 100. Dirigo's best showing came in the 3200 where Blaine Wilkins grabbed the third position and took 23 seconds of his prior best time. You'd be excused if it takes a second look to sort out the results in the women's meet. That's because Cony's twins, Anna and Julia Reny, took four first places between them and helped out in the relays as well. Anna Reny won both sets of hurdles (17.17 & 48.98), and the 200. Meanwhile Julia took the 100 (13.58), ran to a second place finish in her first 800 of the year, and took third in the javelin. Tess Towle won the high jump (4-08) and triple jump (31-04) and came away with a third place in the long jump. But the Renys and Tess Towle were not alone in scoring. Gabby Low placed in all three throws. Erin Wathen and Ashleigh Audet placed in both sets of hurdles and Audet also collected points in the 400. As the season winds toward conference championships there is some jockeying for position and qualifying times. Freshman Julia Reny hadn't run an 800 this year. Brunswick senior Isabella Pols hadn't run one since her own freshman year but both were entered in the unseeded first heat and both bolted off the start line to try and crack the seeded heat. Reny won the heat and finished second overall, while Pols followed her and finished fourth overall. The race was won by Brunswick's Maddie Wayne (2:28.16), the sophomore's third consecutive win on the season. She also placed in the triple jump and two relays. The Dragons also got firsts from Isabella Pols in the 1600, Rosalie White in the shot put (29-11) and Anna Rider in the pole vault. Rider and teamate Tea Kepler each vaulted 8-0, but Rider got the nod on jumps. Anna Kousky finished second in the 100 and placed in the long jump. Lisbon's second place team finish was paced by senior Sydney Douglass with a first place finish in the 1600 race-walk and a solid leg in a second place finishing 4 x 4 team that closed Brunswick just at the finish line. The Greyhounds also claimed first in the 4 x 100 and had a solid performance from Emma Houle who took second in both the long jump and the 200 to go with a leg on the winning 4 x 100 team. Destiney Deschaines took second in the 100 MH and also helped out in the 4 x 1. Reagan Cola led Boothbay with a first in the 400 (103.87) and placed in the javelin and 200. Hannah Cola had the best long jump of the day to win at 18-02. Olivia Paolilla placed in both sets of hurdles. Emma Gould led Morse with seconds in both the triple and high jumps. Skowhegan went one-two-three in the discus as Elzadie Parker won it (81-02). Carey Lee claimed the best javelin throw at 109-05. Tatumn Parker scored in the shot and discus. For Hall-Dale Olivia Bean and Sabrina Freeman each placed in three events. Oak Hill was led by Lindsey Weeks with points in the 800 and 1600.